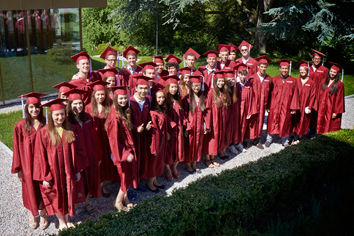 On June 21st our Graduation and Prize-Giving ceremony took place. Congratulations to all our graduates and we wish them well on their journeys. The following students graduated from the British programme of studies, having studied the British A Level programme. Fernando Baptista from Brazil was accepted at Lancaster University, University of Kent; University of Buckingham; Hult University and has chosen to study Business Studies and Economics at Manchester University. Dagmar Berankova from the Czech Republic will take a gap year before entering the Ecole Hôtelière de Lausanne to study Hospitality Management. Ruxandra Bivolaru from Romania will study vocals and Popular Music at the Tech Music School in London. Rafael Bodega from Spain was accepted at Loughborough University, Exeter University and has chosen to study Theoretical Physics at University College London. Erika Conti from Brazil will study at the American University of Paris. Emily Dempsey from the UK will study Sociology and Media Studies with Professional Development at Brunel University. Marie-Laure Diehl from France will study Accounting and Finance at the University of Kent. Ekaterina Dopiro from Russia will study Information Science at EPFL. Audrey Frei from Switzerland was accepted at Exeter University; University of Lausanne, University of Geneva and has chosen to study Politics, Philosophy and Law at Kings College London. Marina Karpova from Russia was accepted at the University of Geneva, the University of Neuchâtel and has chosen to study Biological Sciences at the University of Lausanne. Dominic Lederer from Germany has chosen to study International Business Administration at Hult University. Myung You from Korea was accepted at Glasgow University and has chosen to study medicine at Newcastle University. Anastasia Morozova from Russia has chosen to study Hospitality Management at the Ecole Hôtelière de Lausanne. Patricia Muffat-es-Jacques from France was accepted at the Royal Veterinary College, London; Liverpool University and has chosen Edinburgh University to study veterinary medicine. David Musijenko from the Czech Republic was accepted at University of Kent, Royal Holloway, Queen Mary College, London and has chosen to study Economics with Politics and International Relations at The New School of the Humanities, London. Anastasiya Shevchuk from the Ukraine was accepted at the Ecole Hôtelière de Lausanne, Kings College London, University College London, City University London; Bocconi University and has chosen to to study International Relations & History at the London School of Economics. Aleks Shishmanov from Bulgaria was accepted at Boston University, American University Washington, University of Miami and has chosen to study Liberal Studies at New York University before embarking on a graduate law program. Umarjon Shodiev from Uzbekistan was accepted at Brunel University and has chosen to study Economics and Economic History at the London School of Economics. Adrian Smith from the UK was accepted at Brunel University, University of Kent, Oxford Brookes, European Business School and has chosen to study Business and Management at Reading University. Mark Temnikov from Russia was accepted at the University of Kent, the University of Lausanne and has chosen to study Statistics with Finance at the London School of Economics. Rui Wang from Switzerland was accepted at the University of Lausanne and has chosen to study Law and Economics at the University of St Gallen. The following students completed received a High School Graduation Diploma. Casilda Roca de Togores from Spain will study Business Administration at The College for International Studies in Madrid. Adrian Guell del Barrio from Spain will study at the ESADE Business School in Barcelona. Laura Brumleve from USA will attend St Olaf College in the States to major in Psychology and Film Studies. Andrei-Filip Buciu from Romania will attend the Ecole Hôtelière de Lausanne to study Hospitality Management. Abdul Karim Bustami from USA will attend Concordia University, Irvine, California. Maria Fernanda Goite from Venezuela will attend Franklin College in Lugano. Andrey Gorelov from Russia will attend the Ecole Hôtelière de Lausanne to study Hospitality Management. Wei (William) Lee from Taiwan must complete his military service before heading to college in the States. Faisal Makiya from the USA will attend Pace University, New York. Koffi de Souza from France will attend Glion Hotel School where he will study Sports Management.